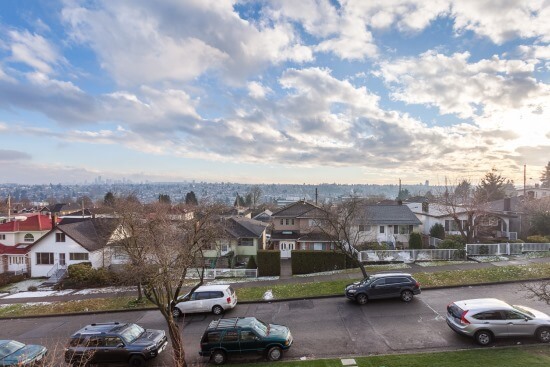 This quiet and comfortable East Van neighborhood is characterized mostly by families living in detached homes on larger lots and wide streets, giving the area a feeling of space and serenity. Kids playing sports in the street and the local parks bustling with moms & tots gives the area a nice family feel. Many of the homes were built between the 1960-1980’s so the homes are a little more open and easier to update then in other more historic neighborhood homes. The schools of the area are very mixed, offering excellent language programs and the promotion of culture sharing and respect. Bordered to the East by Boundary Road and Burnaby beyond, this area has incredibly easy access to the freeway and communities lying outside Vancouver – so it’s popular among commuters. We may see higher density and more retail amenities along Nanaimo as urban sprawl pushes demand east. For now, residents enjoy shopping along Grandview Hwy, East 1st Avenue, Commercial Drive & Hastings Street. Up on the hill near Renfrew, homes enjoy sweeping views South to Metrotown and North to the mountains. The area is undergoing a slow transition from long-time Chinese & Italia residents to new, mixed younger families. Many of the lots are zoned RS-1, so we are watching an influx of laneway homes bringing more mortgage help for the new families, and rental opportunities to the area. Our clients often love the quiet, small-town feel of the streets here while being close to the things they need. To see all school catchment areas and a comprehensive list of all the schools in your neighbourhood you can download the pdf here. $1,498,000 One Percent Realty Ltd.